Vajradhara (Sanskrit: वज्रधर. Also, the name of Indra, because 'Vajra' means diamond, as well as the thunderbolt, anything hard more generally) Tibetan: རྡོ་རྗེ་འཆང། rdo rje 'chang (Dorje Chang); Chinese: 金剛總持; Javanese: Kabajradharan; Japanese: 執金剛; English: Diamond-holder; Vietnamese: Kim Cang Tổng Trì) is the ultimate primordial Buddha, or Adi Buddha, according to the Sakya, Gelug and Kagyu schools of Tibetan Buddhism. In the evolution of Indian Buddhism, Buddha Vajradhara gradually displaced Samantabhadra, who is the 'Primordial Buddha' in the Nyingma, or 'Ancient School.' However, the two are metaphysically equivalent. Achieving the 'state of Vajradhara' is synonymous with complete realisation. According to the Kagyu lineage, Buddha Vajradhara is the primordial Buddha, the Dharmakaya Buddha. 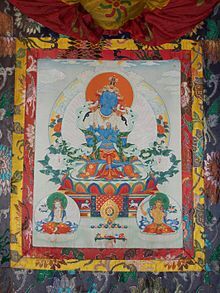 He is depicted as dark blue in color, expressing the quintessence of buddhahood itself and representing the essence of the historical Buddha's realization of enlightenment. Buddha Vajradhara and the Wisdom Buddhas are often subjects of mandala. Buddha Vajradhara and Samantabhadra Buddha are cognate deities in Tibetan Buddhist cosmology with different names, attributes, appearances and iconography. Both are Dharmakaya Buddhas, that is primordial Buddhas: Samantabhadra is unadorned, that is depicted without any attributes; conversely, Buddha Vajradhara is often adorned and bears attributes, which is generally the iconographic representation of a Sambhogakaya Buddha. Both Buddha Vajradhara and Samantabhadra are generally depicted in yab-yum unity with their respective consorts and are primordial Buddhas, embodying void and ultimate emptiness. The Trikaya doctrine (Sanskrit, literally "Three bodies or personalities"; 三身 Chinese: Sānshēn, Japanese: sanjin) is an important Buddhist teaching both on the nature of reality, and what a Buddha is. By the 4th century CE, the Trikaya Doctrine had assumed the form that we now know. Briefly, the doctrine says that a Buddha has three kayas or bodies: the nirmanakaya or created body which manifests in time and space; the sambhogakaya or body of mutual enjoyment which is an archetypal manifestation; and the Dharmakaya or reality body which embodies the very principle of enlightenment and knows no limits or boundaries. In the view of Anuyoga, the 'Mindstream' (Sanksrit: citta santana) is the 'continuity' (Sanskrit: santana; Wylie: rgyud) that links the Trikaya. The Trikaya, as a triune, is symbolised by the Gankyil. 'Shining Relics of Enlightened Body' (Tibetan: སྐུ་གདུང་འབར་བ, Wylie: sku gdung 'bar ba) is numbered amongst the 'Seventeen Tantras of Menngagde' (Tibetan: མན་ངག་སྡེའི་རྒྱུད་བཅུ་བདུན, Wylie: man ngag sde'i rgyud bcu bdun) within Dzogchen discourse and is part of the textual support for the Vima Nyingtik. In the Dzogchen tantric text rendered in English as "Shining Relics" (Tibetan: སྐུ་གདུང་འབར་བ, Wylie: sku gdung 'bar ba), an enlightened personality entitled Buddha Vajradhara and a Dakini whose name may be rendered into English as "Clear mind" engage in discourse and dialogue which is a common convention in such esoteric Buddhist literature and tantric literature in general. ^ * Getty, Alice (1914). The gods of northern Buddhism, their history, iconography, and progressive evolution through the northern Buddhist countries, Oxford: The Clarendon press, pp. 4-6. ^ "Dharmapala Thangka Centre". Archived from the original on 23 September 2012. Retrieved 19 August 2011. Vajradhara is an emanation of Adibuddha, some people say. ^ Martin, Dan (1994). 'Pearls from Bones: Relics, Chortens, Tertons and the Signs of Saintly Death in Tibet'. Numen, Vol. 41, No. 3. (Sep., 1994), p.274. This page was last edited on 19 February 2019, at 01:17 (UTC).